Store and retrieve any record type with smart organization and search tools. With ArchivaLock, you can access your document volumes, folders, cases and books online anytime, anywhere without sacrificing image integrity. All too often, you are forced to load your records to a system that is not specifically tailored to fit each document type loaded. ArchivaLock is the first and only system to make every record type a first class citizen of the system. 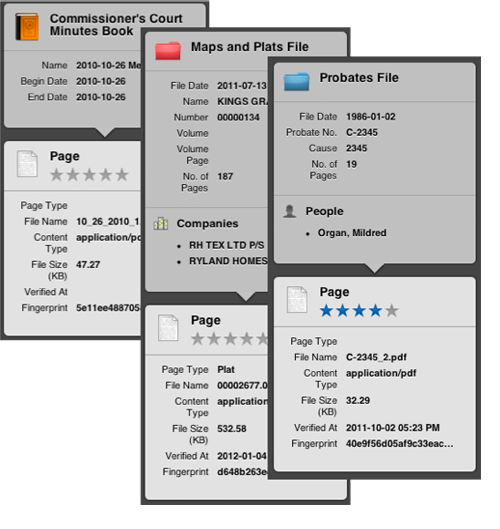 Instead of misusing meta-data fields designed for another record category, ArchivaLock has the specific information fields that are necessary for each document type. This specific type—mapping results in correctly named fields and less blank fields that could overwhelm or confuse you or your constituents. In addition, you will have one central repository for the records allowing you to quickly maintain, analyze and use your documents. No other system provides a centralized home for all of your permanent records that was specifically designed with each record type in mind.